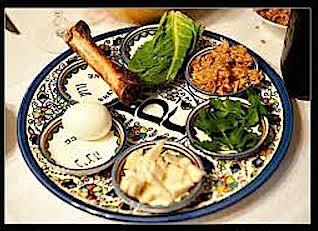 My friend invited me (and 7 others) to a Passover Seder -- a symbolic meal to retell the Jewish Exodus from Egypt. 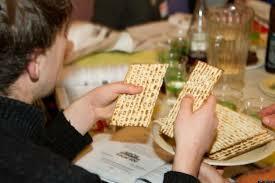 Seders can last for hours; I asked if he would mind if I left early, to take care of my dog. He responded, "Why don't you bring her." She had a bath the night before, and a good brushing. This would be just like her therapy dog shifts... only much longer! I packed her mat for her to sit on; her water bottle and a towel; a comb; her favorite chew toy. And I brought little pieces of matzoh for treats. Matzoh is kind of tasteless, not rewarding, but I couldn't bring her regular dog treats into my friend's "kosher for Passover" home. First stop: the synagogue, for short evening prayers. After that, we would go straight to the Seder; my friend lives down the street. So I put the pup in the car, with her bag of necessities. I felt silly -- at the synagogue, with a dog, walking around the children's play equipment. Then I had a better idea: the lawn! Behind the synagogue, there was a big yard, with a few trees, completely fenced in, and soft, thick grass. I took her out of the play area, removed her leash, and said, "Run!" And she did. When the service concluded, I called to her, and she ran to me. We walked with others to my friend's home, with Chou Chou heeling nicely at my side. At Larry's home, we were greeted by the other guests. I didn't know everyone, so I introduced myself and Chou Chou. She greeted each guest, eagerly going up to each person as she does in animal-assisted therapy. She did not paw or jump. She was sweet. Running at the synagogue wasn't planned, but it was perfect to get her energy level down. I relaxed; this was going to work out okay! After a couple of hours, as we recounted the Jewish Exodus from Egypt, Chou Chou fell asleep. And so, my answer this year to the Passover question -- "Why is this night different from all other nights?" -- was, "Because Chou Chou came with me to the Seder!" no photos were taken at the sedar. I loved reading about your Seder, Chou Chou. How many dogs go to Seders! You were very lucky and you were such a good girl! Happy 4th Birthday, Chou Chou Briard!